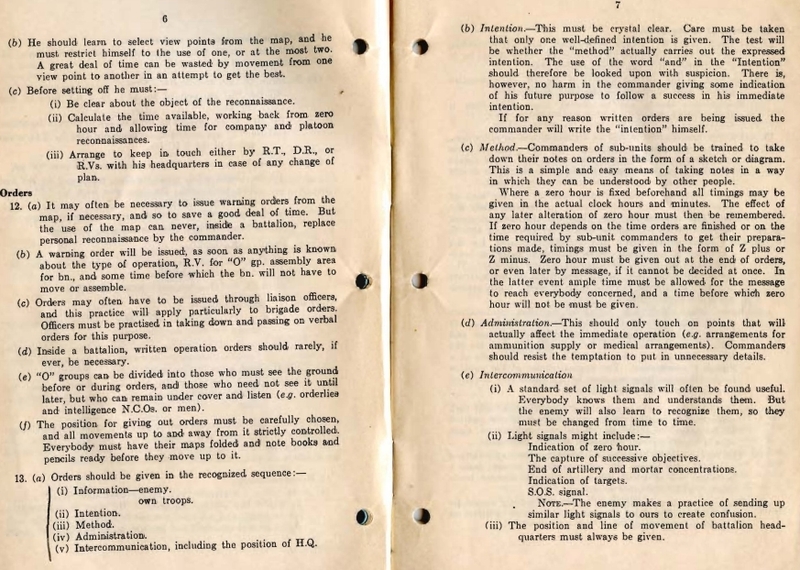 pretty familiar with the NATO's OSMEALQ order format, I was wondering how things were done during WW2, especially by Italians, Germans and Commonwealth soldiers. Would anybody have resources on that matter? Somebody will probably be able to dig up a better German example but I couldn't find one in a hurry. Italians - no idea but the general trend for these things is pretty much the same across the piece. Thanks a lot Combatintman, kudos on the piece of art of yours humbly named "Planning tutorial" by the way. Just found an article about the German Operations Orders, on @Michael Dorrosh's website? 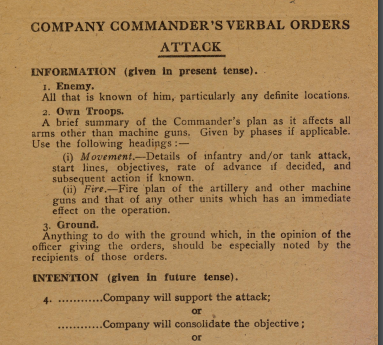 To illustrate Combatintman's answer above, here's an excerpt from the Canadian wartime manual "Infantry Training, Part I: The Infantry Battalion (Ottawa, H.M. Stationery Office, 1944)." And even more! Company Commander's verbal orders in various tactical situations. Great resource, thanks! Just downloading this and other quite interesting PDF´s from the list. Well supplementing my collection of similar US and German FM´s from other sources.